If we think of a hierarchy of ethical ways of dressing, vintage should be near the top. It is the antithesis of throwaway fashion, being rare, covetable and tradable. Rewearing old clothes also displaces the need to make new virgin fibres – manufactured with oil-based petroleum or using cotton – both with hulking environmental impacts (also add in dyeing, finishing and the use of factories with dubious ethics). Thus, from an environmental standpoint, wearing vintage and contemporary secondhand garments keeps clothing out of landfills, and just as importantly, does not necessarily require the use existing resources like water or petroleum. Unfortunately we now need to ask a few more questions of vintage sellers….There are far more now who don’t give a fig for crystal beading and built-in corsetry. They just buy and sell clothing by the kilo, rebranding them as vintage or retro. Here the business model begins to resemble fast fashion. It’s a global market (as is the second-hand trade in textiles), and we now see outsourcing of collection and supply. There have also been unofficial reports of exploitation in sorting factories. International traders deal in huge quantities – the biggest in the US sorts 35 tonnes every day of printed T-shirts and nearly 8 million kg of “vintage” every year for export. Buyers often buy bales “blind”. Vintage becomes about trucks and containers and trading “rag” by the kilo. Here is where my reaction to her piece on the ethics of vintage clothing becomes more complicated. First let me state that if sorting facilities in the U.S. (or other countries) are engaged in unethical labor practices, that is a concern that I share with Siegle. Yet my view of large-scale sorting facilities – they are known as “rag graders” – is tempered by my knowledge of where they fit in the U.S. recycling picture. Few Americans know about rag graders and what they do, so I’ll devote a portion of this post to what I’ve learned so far about the U.S. rag grading industry before coming back to the ethical questions. Clothing that is from decades past is graded as “vintage,” baled, and is sold back to vintage-clothing sellers who are looking for more supply. All of these graded textiles are baled and sold by weight, and the grades determine the price per pound, with vintage clothes most likely commanding a higher price. Rag graders were once mostly local facilities, with nearly every second-tier city having a local rag-grader. As with the clothing industry as a whole, over the last three decades, the industry has become more centralized, consolidated and operates under larger economies of scale, which means there are some large sorting facilities that process tons of used clothing. That said, according to National Geographic, there are 2000 sorting facilities in the U.S., and most are family-owned. Now back to the ethics. As long as a rag grading facility pays fair wages and has good working conditions, I do not view the clothing obtained from them as inherently unethical, as Siegle seems to imply. 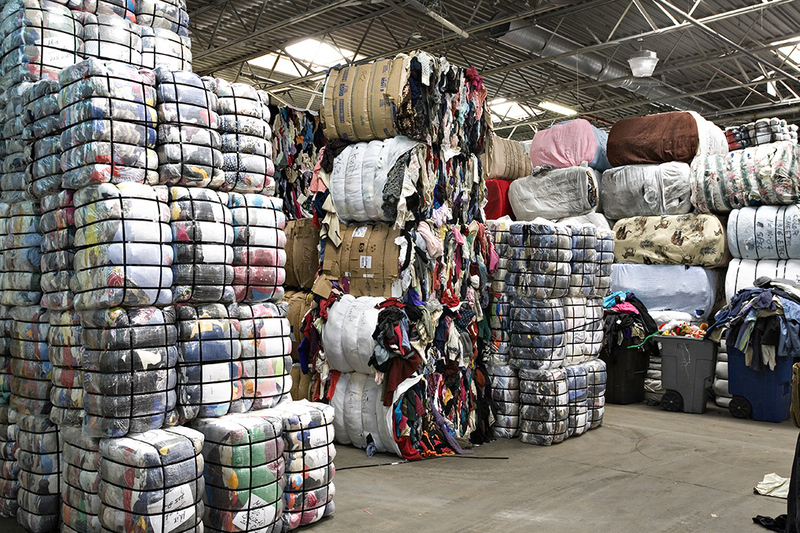 In the U.S. these sorting facilities are a key component of clothing recycling. According to National Geographic, Americans on average discard 68 pounds of clothing a year, and only purchase 1o pounds of recycled clothing. To the best of my knowledge, the U.S. does not have government- subsidized clothing recycling. This means that someone – in this case, rag-graders – must be able to make a profit in order for the recycling of textiles to exist here in any large-scale way. The U.S. used-clothing recycling industry employs 17,000 workers in the U.S. and keeps 2.5 billion pounds of fabric from landfills (and if Americans were far better about recycling every textile as they should be, then it would be exponentially more). The carbon footprint of shipping used textiles – whether it’s vintage clothes traveling in the back of a vintage clothing store owner’s van or bales of used clothing heading by ship to Africa – is a legitimate environmental concern. It would be better if all used clothing went into re-use locally. But if that’s not possible or presently likely, I would rather that the clothes move on a slow boat (or better yet, rail) than be deposited in local landfills. Siegle ends her editorial with the words that “Vintage needs to be cleaned up.” My thought is that relatively speaking (with the caveats about labor and the environment I’ve already expressed), I don’t think that vintage is all that dirty to begin with and that vintage (or contemporary secondhand) is still a reasonable ethical choice.